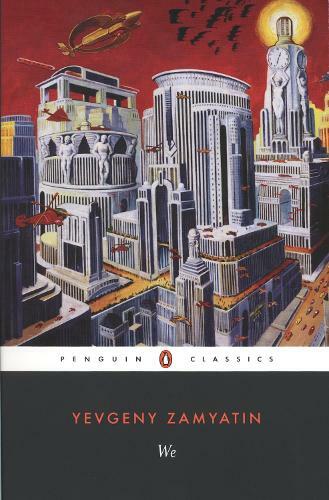 A seminal work of dystopian fiction that foreshadowed the worst excesses of Soviet Russia, Yevgeny Zamyatin's We is a powerfully inventive vision that has influenced writers from George Orwell to Ayn Rand. This Penguin Classics edition is translated from the Russian with an introduction by Clarence Brown. In a glass-enclosed city of absolute straight lines, ruled over by the all-powerful 'Benefactor', the citizens of the totalitarian society of OneState live out lives devoid of passion and creativity - until D-503, a mathematician who dreams in numbers, makes a discovery: he has an individual soul. Set in the twenty-sixth century AD, We is the classic dystopian novel and was the forerunner of works such as George Orwell's 1984 and Aldous Huxley's Brave New World. It was suppressed for many years in Russia and remains a resounding cry for individual freedom, yet is also a powerful, exciting and vivid work of science fiction. Clarence Brown's brilliant translation is based on the corrected text of the novel, first published in Russia in 1988 after more than sixty years' suppression. Yevgeny Zamyatin (1884-1937) was a naval engineer by profession and writer by vocation, who made himself an enemy of the Tsarist government by being a Bolshevik, and an enemy of the Soviet government by insisting that human beings have absolute creative freedom. He wrote short stories, plays and essays, but his masterpiece is We, written in 1920-21 and soon thereafter translated into most of the languages of the world. It first appeared in Russia only in 1988. If you enjoyed We, you might like George Orwell's 1984, also available in Penguin Classics.